A trio of mouse studies published today (May 11) provides some of the strongest evidence yet that Zika virus infection can cause birth defects. 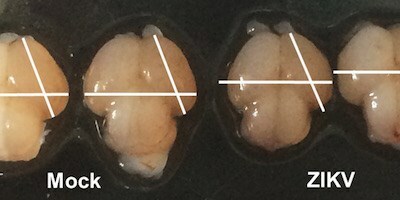 Researchers at the University of São Paulo in Brazil and their colleagues reported in Nature that the Brazilian strain of the virus could cross the placentas of pregnant mice, resulting in microcephaly in developing embryos. Meanwhile, researchers from the Chinese Academy of Sciences reported similar findings in Cell Stem Cell after having studied a different infection route. And researchers at the Washington University School of Medicine in St. Louis found that Zika can infect pregnant, immune-deficient mice and their fetuses, causing restricted growth and fetal death; their findings were published in Cell. Three studies show that the virus can cause birth defects in mouse embryos.